of Cambridge. This map below shows the location of our two centres. 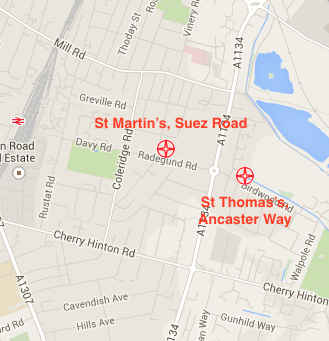 If you are driving to St Martin’s, you must approach from Radegund Road or from Coleridge Road via Hobart Road. There is a road closure at the junction of Suez Road and Hobart Road, and if you enter our postcode CB1 3QD into a route planner, you may end up at the wrong side of this.